Like Oktoberfest with better weather, Bergkirchweih is an annual volksfest (folk festival) in Erlangen, Bavaria. Revelers gather beneath towering chestnuts and oaks on 11,000 seats to enjoy local beer. Over the course of the festival there are over one million visitors - about ten times the town's population. 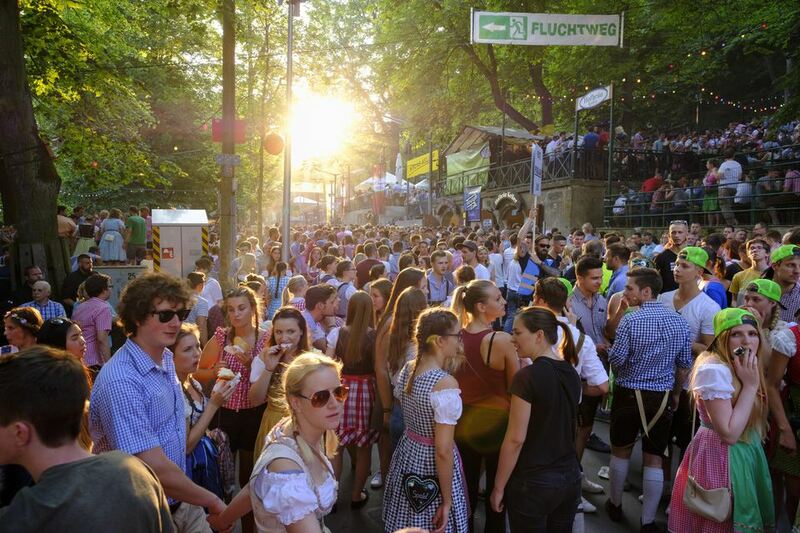 Discover more about this popular festival and have a drink in the biggest open-air-biergarten in Europe. Erlangen dates all the way back to 1002, but this festival actually commemorates the birthday of the market square. It is one of the oldest festivals in Germany. Does Bergkirchweih feel like a tongue-twister? Try pronouncing it like the locals. The festival is known as berch in the Franconian dialect, their pronunciation of berg (mountain). To blend in even further, dress in the proper Bavarian gear of tracht (lederhosen and dirndl). The bierkeller (beer cellars) are interspersed in the hill among the booths and carnival rides. Look for the ever-present riesenrad (Ferris wheel) to mark the spot. Make your way between the many bierkeller, sampling their beers and singing the songs. Just like Oktoberfest, about every half hour the long benches get bouncing as German-speakers shout out "Ein Prosit"! All the beer is local with special festbiers brewed for the event. Brewers like Kitzmann and Steinbach are just two of the storied brewers featured here. Read more about the many Bierkellers and their products on the www.berch.info website. Beers come in a variety of styles - but beware that they are generally stronger than normal German beers. This paired with the heat can make for a dangerous combo for staying upright. Radlers (beer and lemonade mix) and Weißbier are savers for lighter drinkers. Festbier is served by the maß (litre) in hefty beer mugs with a unique design for each year. Order "Ein Maß bitte" for 9 euro - not forgetting the 5 euro Pfand (deposit). If they give you a token with the glass, you many need to return the token to get the refund. You can keep the mug, or return it for the deposit. It makes a great souvenir. No glass is allowed into the festival (watch for young people saving money by drinking a crate on their walk into the fest, known as Kastenlauf or "crate walk"). Classic fest food is available on every corner. Wurst (sausage), brezeln (pretzels), and local Obatzda cheese should all be sampled. But if you need a full meal, take a seat at Entla’s Keller for traditional meals like Schweinhaxe or ox. The Fest is open daily from 10:00 til 23:00 (and from 9:30 on public holidays and Sundays). June 6th - Anstich: The festival traditionally begins on the Thursday before Pentecost. At 17:00, the mayor taps the first keg at Henninger Keller and it is free beer for the first lucky drinkers. June 13th - Family Day: If you were worried about boozing with the kids, have no fear. Even on its rowdiest days the Fest is fine for families. But this special day offers discounts on rides and attractions until 20:00. June 16th: If you want to recognize the soulful side, there is a church service at Erich Keller at 9:00. June 17th - Closing Ceremony: The end of the festival means it is your last chance to jump on the rides and return your Maß until next year. The festival takes place in the Mittelfranken (Middle Franconian) town of Erlangen. This Bavarian hamlet lies to the north-west of Nuremberg and just south of Bamberg and is well connected by motorway, rail and bus. As indicated by its nickname of Berch (or Berg), the festival itself is situated up a slight hill. Walk to the festival in about 10 to 15 minutes from Erlangen Bahnhof. Just join the masses as they make their way to the Fest or you can even do your own Kastenlauf. Regular bus service connects the city (from Hugenottenplatz) to the berg. If you feel too tipsy to make your way from the fest, the local bus company (VGN) runs a dedicated night line from Leo-Hauck-Straße. If you prefer to drive yourself (and hold back on the beer), parking is limited nearby, but you can leave your car at a parkhaus (parking garage) in town and walk or bus in. Keep small change on hand for the toilets. Each use costs 50 cents, paid by dropping your coin in the dish by the door for the attendants. Also try to go before it is too late, lines can be excruciatingly long for women. Men, you luck out with a free pissoir so avoid using the trees.